When a leading aerospace manufacturer sought a solution to manage assembly line workers with no previous manufacturing experience, they decided to try something novel that set a precedent for their future manufacturing operations management (MOM) strategy. Using the latest manufacturing software featuring situational awareness graphics on plant floor touchscreens, they quickly trained an unskilled workforce to build safety critical electronics without defects, and in-turn ramped up production within days. With the touchscreen software monitoring and controlling the hundreds of process steps needed to build the products, problems and defects could not go unchecked so error-proofing was maximized. All manufacturing stakeholders become accountable for the quality of the product, and the efficiency or timing in which it is assembled when individuals report to their own work station touchscreens. The information created because of those individual’s interaction with the touchscreens is also broadcast to larger plant floor displays for all team members to see, critique, and ultimately act on. This manufacturing methodology emphasizes every line worker’s and supervisor’s own responsibility to contribute positively to the over-all goal of manufacturing products of high quality in an efficient way, i.e. in time with the least amount of waste produced. The assembly line workers and area supervisors become fully-accountable for the finished product the instance they log into the user interface software with their own unique login and password. Figure 1 shows an example SmartScreen user interface with various situational awareness graphics reporting the individual line worker/work station details and real-time performance; including the scheduled production time, the real-time status of the Goal Planned Actual (GPA), and Overall Equipment Effectiveness (OEE) ensuring the line worker is aware and reminded of how they are progressing in the process steps they are required to complete within cycle time. Since each manufacturing stakeholder is identified by her/his own credentials, they must succumb to the first level of assembly line error-proofing. The software behind the user interface touchscreen identifies the worker and then confirms (before any work can start or tools are enabled) whether that person is actually “qualified” to do the work or not. The software ensures quality by authenticating that the person has received the proper training to perform the process steps; and that they are aware of the latest quality alerts, and safety requirements unique to their workstation or processes. 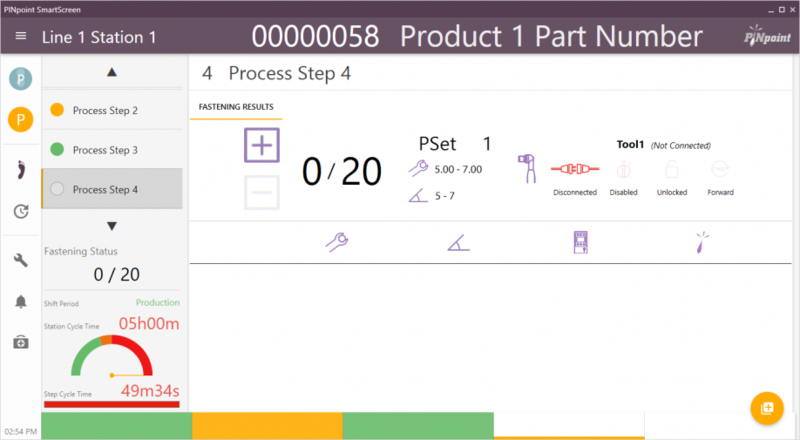 Much more than a simple touchscreen, at the heart of the user interface software is a manufacturing execution system (MES) and multi-dimensional database containing all the information required to build the product, along with the record of the line worker’s credentials, their training, and their historical assembly line performance up-to-the-second. Once the line worker is verified the user interface presents her/him work instructions so they can begin performing process steps to build the product. In the case of the common fastening operation, the user interface displays the tolerances required for the fastening operation. Figure 2 shows an example SmartScreen where the line worker has progressed to “Process Step 4” requiring them to perform 20 total fastening operations within the parameter set (PSet) of 5.00 – 7.00Nm at an angle of 5 - 7°. The line worker is motivated to perform each process step carefully and quickly since they are made aware of the cycle time remaining to complete the operation via the cycle time gauge shown at the bottom left side of the main screen. Along the bottom of the screen are colored bars that can also be configured to indicate and further re-enforce visually how they are progressing. Once the worker begins performing the fastening operation the touchscreen displays their “Fastening Results” step-by-step with textual data and graphics that clearly show the worker’s progress (see Figure 3). Not only does the touchscreen guide the worker in each fastening operation, the system closely monitors their performance and can halt their progress, and even turn off their tools should any operation be performed outside the set parameters. 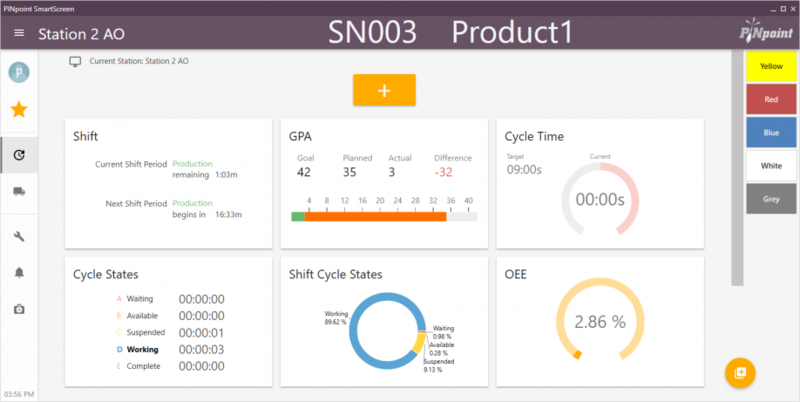 The touchscreen user interfaces and software not only motivate line workers, they create a more team based approach to manufacturing execution that instills a new culture, and closed-loop of accountability in the factory where all manufacturing stakeholders are made accountable for what they contribute. The data generated by the line workers activities and the data recorded from the machines also becomes indispensable given its’ importance as business intelligence and manufacturing intelligence reports that are output and essential for further optimizing manufacturing operations. PINpoint V5 software is meticulously designed and tested to 'Information Technology Infrastructure Library' (ITIL) standards before any official version release. Thoroughly proven the software is in use daily around the World in multiple languages by leading manufacturers. Anthony offers over fourteen years of manufacturing optimization knowledge, with an aptitude for solving problems which increase business and manufacturing efficiency. He has successfully provided solutions to various multinational manufacturers involving the latest technology in sensors, laser (detection, measurement, welding, cutting, and marking systems), PLC, machine vision, digital microscope, and manufacturing software.